Hello, friends! Remember when I wrote my eBook, launched it, then completely fell off the earth? You know that phrase, "you bit off more than you could chew?" And I have a really fun giveaway to share with you today! 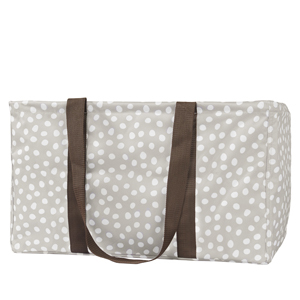 It's a Large Utility Tote from Thirty One. I actually have one of these bags, and it is great! I've used it for trips, moving, groceries, you name it. It's big enough to hold lots of stuff, but it also collapses for easy storage! I have to thank my friend Heather for sponsoring this giveaway. Heather is a caregiver to her boyfriend, Colin, who is a paraplegic. We had the honor of meeting them last year and they are a great couple. You can check out Heather and Colin's blog here. And Heather's Thirty One shop here. Now, here's the deal with this Giveaway. All you have to do is buy the eBook (it's totally fine if you've already bought it) and send me a receipt to my email: danabrownritter@gmail.com. I'll keep this giveaway open until 12:00pm on Thursday, April 18th, and I'll announce the winner on Friday, April 19th. I will just choose the winner randomly. If you've participated in other eBook related giveaways, that's totally fine! Feel free to enter this one, too! I want to thank y'all so much for all of your support with the eBook project, and these giveaways are just a fun way to do that.